This is an abstract base class to receive events from a ConnectionBase-derived object. Definition at line 33 of file connectiondatahandler.h. Definition at line 39 of file connectiondatahandler.h. 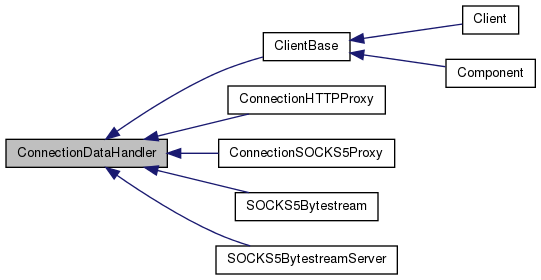 Implemented in ClientBase, SOCKS5Bytestream, ConnectionSOCKS5Proxy, ConnectionHTTPProxy, and SOCKS5BytestreamServer.